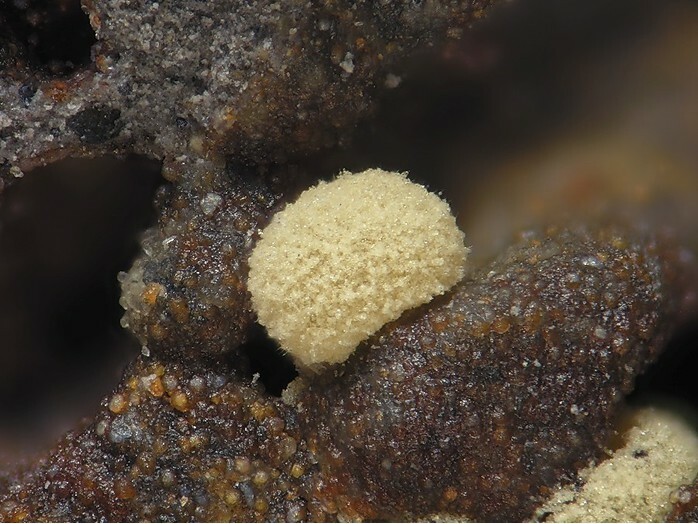 Halloysite: Mineral information, data and localities. White to tan, sometimes greenish or bluish, also chocolate brown to reddish. 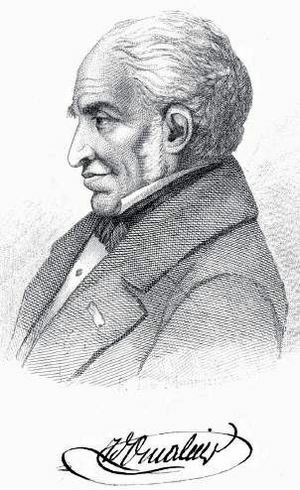 Named after the Belgian geologist Jean-Baptiste d'Omalius d'Halloy, (February 16th 1783 - January 15th 1875), who discovered the mineral. He was a nobleman, a statesman, and pioneer of modern geology in Belgium. Typically found as earthy to somewhat waxy looking extremely fine-grained clayey masses, white to tan and also occasionally bluish or greenish. The name halloysite currently stands for the two grandfathered and distinct species Halloysite-7Å and Halloysite-10Å. Halloysite-10Å is also known as "endellite" in European literature and considered to be a hydrated mineral - the "hydrated halloysite" of North American literature. "Metahalloysite" (= Halloysite-7Å) is dehydrated halloysite and characterised by a reduced interlayer spacing. Originally reported from Angleur, Liège, Liège Province, Belgium. Also reported as a biomineral formed by the action of lichen (e.g., Lasallia spp., Mucor spp., etc.) on cave deposits and waters (vide Burford et al., 2003). Paler than the color, or white. Typically found as extremely fine-grained clayey masses. The two "forms" Halloysite-7Å and Halloysite-10Å are the most common. It has a tubular morphology at the nanometer scale. Ferrian Halloysite An Fe-rich variety of halloysite. Zirconian Halloysite Halloysite with content 3-4 wt.% ZrO2. Atacamite 68 photos of Halloysite associated with Atacamite on mindat.org. Libethenite 45 photos of Halloysite associated with Libethenite on mindat.org. Pseudomalachite 25 photos of Halloysite associated with Pseudomalachite on mindat.org. Chrysocolla 18 photos of Halloysite associated with Chrysocolla on mindat.org. Adamite 3 photos of Halloysite associated with Adamite on mindat.org. Kornerupine 2 photos of Halloysite associated with Kornerupine on mindat.org. Mimetite 2 photos of Halloysite associated with Mimetite on mindat.org. Olivenite 2 photos of Halloysite associated with Olivenite on mindat.org. Chamosite 2 photos of Halloysite associated with Chamosite on mindat.org. Cerussite 1 photo of Halloysite associated with Cerussite on mindat.org. Used in applications similar to those of kaolinite, such as high-strength cements and high-quality ceramics. Clays and Clay Minerals (1978) 26: 25. Gaines, R.V., Skinner, H.C.W., Foord, E.E., Mason, B., Rosenzweig, A. (1997) Dana's New Mineralogy: The System of Mineralogy of James Dwight Dana and Edward Salisbury Dana: 1411. Joussein, E., Petit, S., Churchman, J., Theng, B., Righi, D., Delvaux, B. (2005) Halloysite clay minerals — A review. 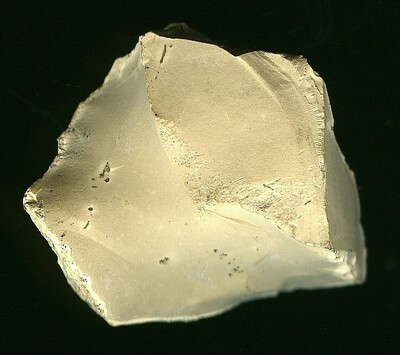 Clay Minerals: 40: 383–426. ROBL, Klaus; BRODTKORB, Milka K.de and AMETRANO, Silvia. The Miocene epithermal mineralization of the Quevar Stratovolcan Complex, Salta. Rev. Asoc. Geol. Argent. [online]. 2009, vol.64, n.3, pp. 525-539. Rattigan, J. H. (1967): Phenomena about Burning Mountain, Wingen, N.S.W.. Aust. J. Earth Sciences 30, 183-184. John L. Keeling, Peter G. Self and Mark D. Raven (200): Halloysite in Cenozoic sediments along the Eucla Basin margin. MESA Journal 59, 24-28. G.H.F.Ulrich 1870. Contributions to the Mineralogy of Victoria 1870, pg 20. Hagenguth, G. (1988): Die Gipsvorkommen bei Edelsdorf im Stanzertal (Steiermark). Archiv für Lagerstättenforschung der Geologischen Bundesanstalt, 9, 47-58. Anthony, et al, Handbook of Mineralogy, Vol. 4. [MinRec 32:472]; アルセオスバルト, & 南部正光. (1989). 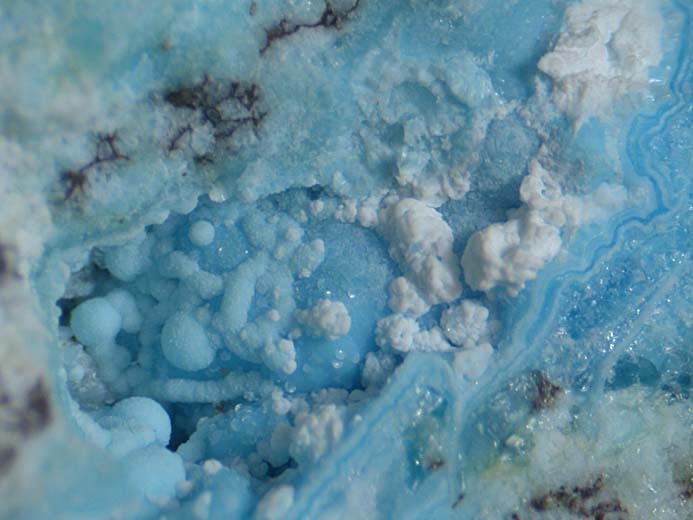 Fluid inclusion study in the Huanuni mine, Bolivia. 資源と素材, 105(14), 1073-1078. Chukanov, N.V., Krivovichev, S.V., Chernyatieva, A.P., Mohn, G., Pekov, I.V., Belakovskiy, D.I., Van, K.V., Lorenz, J.A. (2013): Vendidaite, Al2(SO4)(OH)3Cl·6H2O, a new mineral from La vendida copper mine, Antofagasta Region, Chile. Canadian Mineralogist. 51, 559-568. Terry Szenics, based on unspecified analysis. Wilson, I.R. (2004): Clay Minerals 39(1), 1-15. Hanlie Hong and Liyun Tie (2005): Clays and Clay Minerals 53(2), 162-170.; Wang, M., Zheng, Y., Xu, R., Liu, Y., Xiao, F., Cheng, S., & Sun, X. (2014). Fluid inclusion, siliceous rock geochemistry of Shewushan lateritic gold deposit, Hubei Province, eastern China: Implication for the genesis of primary orebody. Chinese Journal of Geochemistry, 33(1), 65-76. Shu-Gen Zhang, Xiao-Hu Liu, and Jun Ding (2006): Acta Petrologica et Mineralogica [Yanshikuangwuxue Zazhi] 25(5), 433-439. Wu, C., Yuan, Z., and Bai, G. (1996), In: Jones, A.P., Wall, F., and Williams, C.T. (Eds. ): Rare Earth Minerals: Chemistry, Origin, and Ore Deposits. Mineralogical Society Series, Vol. 7, Chapman and Hall (London), pp. 281-310. Chen, P.Y., Lin, M.L., and Zheng, Z. (1997): Applied Clay Science 12(1/2), 1-25. Zong-Ting Liao, Zheng-Yu Zhou, and Ying Teng (2004): Journal of Tongji University (Natural Science) [Tongji Daxue Xuebao (Ziran Kexueban)] 32(7), 897-900. Peuraniemi, V. and Islam, R., 1993. The weathering in the Vuotso-Tankavaara area- The first evidence of halloysite in Finland. The Chemical eology, 107, pp. 307-311. R.PIERROT, L. CHAURIS, C. LAFORET (1973) : "Inventaire minéralogique de la France : 29- Finistère. ", B.R.G.M. Paris. Lacroix, A. (1910): Minéralogie de la France et de ses colonies, Librairie Polytechnique, Ch. Béranger Editeur, Tome I, 476.
ⓘ Bois du Roi ? von Engelhardt, W., and Goldschmidt, H. (1954): Contributions to Mineralogy and Petrology 4(2), 319-324. Gilg, H.A., and Frei, R. (1997) in: Pei Rongfu (ed. ): Proceedings of the 30th International Geological Congress, Vol.9, VSP (Utrecht, Tokyo), pp. 123-132. Baret, Ch. (1905): Catalogue de la Collection de Minéralogie de la Loire-Inférieure, Muséum de Nantes, 121. Lang, O. (1890): Die Erzlager von Laurion. Prometheus, I, Nr. 25, 392-396. Al-Bassam, K.S., and Tamar-Agha, K.Y. (1998): Mineralium Deposita 33, 266-282. Barrese, E., Giampaolo, C., Grubessi, O., Mottana, A. (1986) Ranciéite from Mazzano Romano (Latium, Italy). Mineralogical Magazine, 50, 355, 111-118; Barbieri, M., Barrese, E., Giampaolo, C., Grubessi, O., Mottana, A., Voltaggio, M. (1993) Genesis of the manganese deposit of Mazzano Romano (Latium, Italy). Geologica Romana, 29, 113-129. Simeone, R., and Simmons, S.F. (1999): Mineralium Deposita 34, 705-717. Savelli F. (1935): Il giacimento di Caolino e Alloysite di valle Pozzatello, Tirreno. Atti Soc. Ital. Progr. Sc., 23, 572-573; Ventriglia U. (1948): Sulla costituzione mineralogica e sulla sistematica minerogenetica delle argille. Per. Mineral., 17, 189-217. E. Manasse, 1912 - Ricerche petrografiche e mineralogiche sul Monte Arco (Isola d'Elba) - Atti Soc. Tosc. Sc. Nat., Mem. Serie A, 28:118-199. Bertoldi, G., Boscardin, M., Mattioli, V. (1984): Interessante Mineralien aus dem Vicentino, Italien. Lapis, 9(2), 18-25. Sakae and Sudo (1975) Am. Min. 60, 331-334; Aizawa and Fuji (1993) Journ. Speleol. Soc. Japan, 18, 11-16. 奥村滋. (1986). Weathering process of Nabari gabbroic body. (2) Congruent dissolution of plagioclase. 岩石鉱物鉱床学会誌, 81(3), 116-128. 中川昌治, 珍並美佳, & 谷川大造. (1998). 対州陶石阿須鉱床と熱水鉱物. The Azu Deposit of Taishu Toseki and the Hydrothermal Minerals; Masaharu NAKAGAWA (2001) Clay Minerals in Taishu Toseki and Taishu Hakudo. Journal of the Clay Science Society of Japan, 41 (2001-2002), #3, 113-122 (in Japanese). Sudo, S. (1991) Mining Geology, 42, #3.; Takagi, T., Naito, K., Collins, L. G., & Iizumi, S. (2007). Plagioclase–quartz Rocks of Metasomatic Origin at the Expense of Granitic Rocks of the Komaki District, Southwestern Japan. The Canadian Mineralogist, 45(3), 559-580. Ariffin, K. S., Rahman, H. A., Hussin, H., & Hadi, K. A. A. (2008). The genesis and characteristics of primary kaolinitic clay occurrence at Bukit Lampas, Simpang Pulai, Ipoh. Bulletin of the Geological Society of Malaysia 54:9–16. Dilley, L. M. (1993). Mineralogy and fluid inclusion study of the San Mateo vein, Fresnillo district, Zacatecas, Mexico (Master's thesis, New Mexico Institute of Mining and Technology). L. O. Kvamsdal (1998): Mineralene fra Nordmarkitt og Grefsensyenitt i Oslofeltet. AS Merkur-Trykk, Oslo(in Norwegian), p. 47.
ⓘ Quisque mining district (Minasaragra) ? Gomes, M.E.P., Antunes, I.M.H.R., Pacheco, F.A.L., Neiva, A. M. R., and Silva, P.B. (2010): Goldschmidt Conference Abstracts 2010.
ⓘ Lipovka Mine (Lipovskoe Mine; Lipovskaya Mine; Lipovaya Mine) ? Bull. Soc. Franç. Minéralo. Cristallo. , 1964, LXXXVII, p. 288. Decrée et al. (2008): Ore Geology Reviews 33, 397-410. Yilmaz, H., Tolga, O., Arehart, G.B., Colakoglu, A.R., and Billor, Z. (2007): Ore Geology Reviews 32, 81-124. Anthony, J.W., et al (1995), Mineralogy of Arizona, 3rd.ed. : 372; Schwartz, G.M. & C.F. Park, Jr. (1932), A microscopic study of ores from the Campbell Mine, Bisbee, AZ, Econ.Geol. : 27: 39-51. Galbraith, F.W. & D.J. Brennan (1959), Minerals of AZ: 108. MRDS database Dep. ID #10046353, MRDS ID #M241482. Anthony, J.W., et al (1995), Mineralogy of Arizona, 3rd.ed. : 266; Schwartz, G.M. (1947), Hydrothermal alteration in the 'porphyry copper' deposits, Econ.Geol. : 42: 319-352; Galbraith, F.W. & D.J. Brennan (1959), Minerals of AZ: 108. Anthony, J.W., et al (1995), Mineralogy of Arizona, 3rd.ed. : 257; Schwartz, G.M. (1947), Hydrothermal alteration in the 'porphyry copper' deposits, Econ.Geol. : 42: 319-352. Anthony, J.W., et al (1995), Mineralogy of Arizona, 3rd.ed. : 173; Robinson, R.F. & A. Cook (1966), The Safford copper deposit, Lone Star mining district, Graham Co., AZ, in S.R. Titley and C.L. Hicks (editors), Geology of the porphyry copper deposits, southwestern North America, Univ. AZ Press, Tucson: 251-266. Anthony, J.W., et al (1995), Mineralogy of Arizona, 3rd.ed. : 105; Schwartz, G.M. (1947), Hydrothermal alteration in the 'porphyry copper' deposits, Econ.Geol. : 42: 319-352; Schwartz, G.M. (1958), Alteration of biotite under mesothermal conditions, Econ.Geol. : 53: 164-177. Anthony, J.W., et al (1995), Mineralogy of Arizona, 3rd.ed. : 174; Jones, R.W. & W.E. Wilson (1983), The Ray mine, Min.Rec. : 14(5): 311-322. Barnes, R. & M. Hay (1983), Famous mineral localities: The Magma Mine, Min.Rec. : 14: 72-82. Carlson, D.W. & W.B. Clark (1954), Mines and Minerals of Amador County, California: California Journal of Mines and Geology: 50(1): 223-225; Pemberton, H. Earl (1983), Minerals of California; Van Nostrand Reinholt Press: 436. Kelley, Vincent Cooper (1936), Occurrence of claudetite in Imperial County, California: American Mineralogist (1936): 21: 137-138; Pemberton, H. Earl (1983), Minerals of California; Van Nostrand Reinholt Press: 185-186. Rogers, Austin Flint (1912b), Notes on rare minerals from California: Columbia University, School of Mines Quarterly: 33: 381; Knopf, Adolf (1918a), A geologic reconnaissance of the Inyo Range and the eastern slope of the southern Sierra Nevada, California; with a section on the stratigraphy of the Inyo Range, by Edwin Kirk; USGS PP 110, 130 pp. : 115; Merriam, Charles Warren (1963), Geology of the Cerro Gordo Mining District, Inyo County, California: USGS PP 408, 83 pp. : 46; Pemberton, H. Earl (1983), Minerals of California; Van Nostrand Reinholt Press: 437. Sharp, W.E. (1959) Minerals from Los Angeles County, California. Printed privately, Los Angeles, California: 49; Pemberton, H. Earl (1983), Minerals of California; Van Nostrand Reinholt Press: 437. Clarke, F.W. & T.M. Chatard (1884), Mineralogical notes from the laboratory of the US Geological Survey: American Journal of Science, 3rd. series: 28: 23; Clarke, F.W. & T.M. Chatard (1884), Halloysite from California: USGS Bulletin 9: 12-13; Murdoch, Joseph & Robert W. Webb (1966), Minerals of California, Centennial Volume (1866-1966): California Division Mines & Geology Bulletin 189: 213.
ⓘ South Table Mountain ? Januzzi, Ronald E. (1976): Mineral Localities of Connecticut and Southeastern New York State (Taylor Assoc./Mineralogical Press): 234-5. Wesleyan University collection; Schooner, Richard. (circa 1980s), Untitled manuscript on central Connecticut mineralogy. Rocks & Min. :64:185; Hurst & Crawford(1970). Callaghan, E. (1948) Endellite deposits in Gardner Mine Ridge, Lawrence County, Indiana: Indiana Dept of Conservation Bulletin 1, pages 6,8 and 15. Shaub, B. M and Schenck, B. J. (1954). Pollucite From Lithia, Massachusetts (American Mineralogist 39:661). Gibson, P. C. (1987). Geology of the Buckskin Mine, Douglas County, Nevada (Masters thesis, University of Nevada, Reno). USGS Bull 741; U.S. Geological Survey (2005) Mineral Resources Data System: U.S. Geological Survey, Reston, Virginia. USGS Prof Paper 973F; U.S. Geological Survey (2005) Mineral Resources Data System: U.S. Geological Survey, Reston, Virginia. Minerals of New Mexico 3rd ed. ; Ratté, J. C. (2008). The Early Oligocene Copperas Creek Volcano and geology along New Mexico Higway 15 between Sapillo Creek and the Gila Cliff Dwellings National Monument, Grant and Catron Counties, New Mexico. Timothy Hanson, 1994 Mineralogical Record pp 195-202 "Copper Roses from the Rose Mine, Near San Lorenzo, New Mexico"
Harvard Mineralogical Museum, no. 119105. Klemic, Harry and Mary Mrose, (1972) Geologic relations and x-ray crystallography of wavellite from Jackson County, Wisconsin and their geologic implications: U.S.G.S. Professional Paper 800-C: C-53 - C-62. Falster, A.U. (1984) Wavellite in Jackson County, Wisconsin: Rocks and Minerals, 59 (3): 125-126. Mirzaev, A.U., and Chinikulov, K. (2004): Lithology and Mienral Resources 39(1), 60-69.